Just when I was in the market for a new robe because my old one had begun to disintegrate on my body, Helen of Helen's Closet had a new robe pattern ready for testing! My first sewing project back in the U.S., and my first project on my new baby, an all-metal vintage Bernina! My mom really loved the Megan Nielsen Dove Blouse we made her a few months ago, and I had a piece of cotton lawn purchased from Belleboo with her in mind, so the combination was a no-brainer. Plaid McCall's 6044: Now with Sleeve and Yoke Mods! My husband was green in the face over the classic plaid shirt I made for myself. If it weren't for the oversized buttons and bust darts, I think he might have tried to steal the shirt for himself. Since I lived there until very recently, I receive almost weekly emails through my blog from people asking where to go fabric shopping in Bangkok when they visit on holiday or work travel. 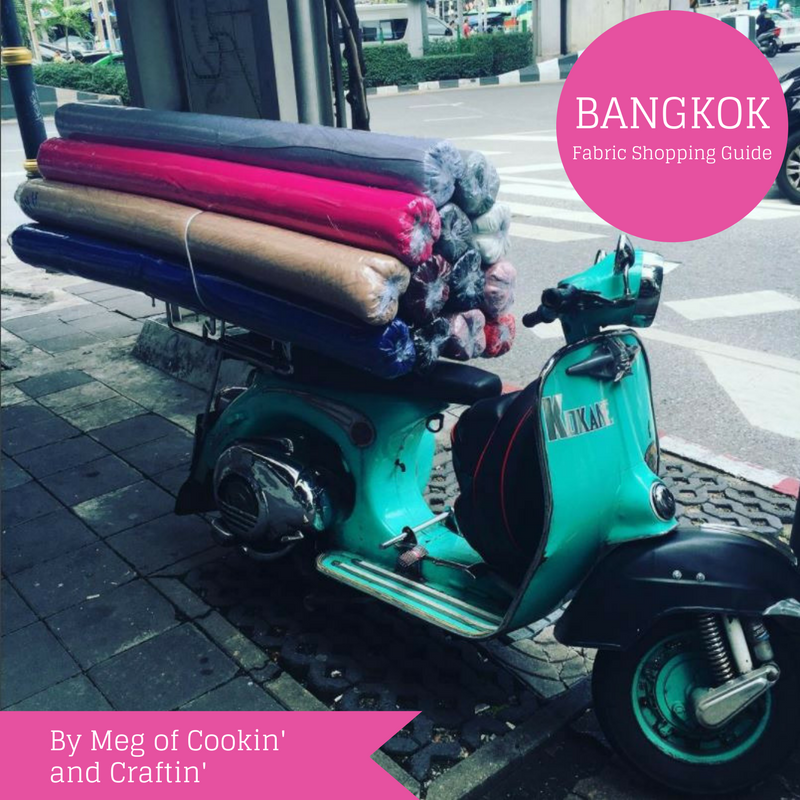 I've also met up with lots of sewcialists who've stopped through and people seem happy with the fabric shops I've taken them to, so I've decided to do a little write-up on fabric shopping in Bangkok. And by little, I mean epic. Long post! Please note, this is not an exhaustive list, by far. Bangkok is a massive, sprawling city with probably hundreds of fabric and haberdashery shops. I am focusing on the major highlights as well as my regular haunts. 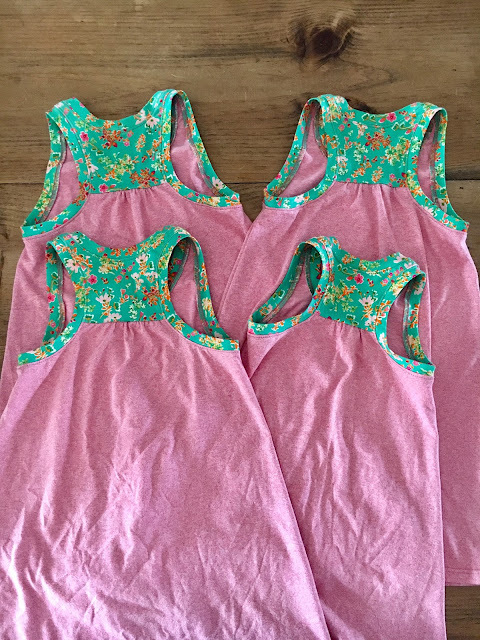 A few months back I made these dress for the little ladies in my life: my two nieces and the two daughters of our friends in Bangkok. I know there's some debate out there about whether there are too many indie t-shirt sewing patterns on the market, but I am definitely on Team You Can Never Have Enough T-Shirt Patterns! At the end of 2016, I set a few 2017 sewing goals for myself as part of Gillian's Top 5 sewing round-up. Halfway through the year, here's an update on my progress! I've made a dent in some of my goals, but others I haven't even touched yet. At the same time, some of my plans have changed due to my move. The swimsuit, for instance, is less of a priority since I've just moved away from S.E. Asia, whereas the coat project seems more dire! Sewing sweaters and flannel things has also become a priority. Returning to knitting and crochet should be on the list, too. Negligible progress on this goal. I made a couple of pairs of cotton/spandex undies from scraps of other project, but really haven't really settled on a favorite pattern yet. And I haven't tried bras yet, either. I pulled out the Watson bra kit I have and almost cut into but panicked and put it away again. For some reason I find the bra-making materials intimidating. No idea why. 3. More pants and jeans! This one is going well... Curvy Pants Month at the Curvy Sewing Collective really pushed me on this one. I've made a whole bunch of pants, including the Style Arc Margaret, Named Alexandria Peg Trousers, Style Arc Georgie Jeans, Style Arc Lazo Trousers, Named Ninni Culottes and a couple pairs of not-yet-blogged jeans. I made an unlined wool coat, the Style Arc Riley, which I love and think will be perfect for fall. I've also made a Hampton Jean Jacket, which will be great for layering, but I think I'd still like to make a legitimate winter coat, lining and all. 5. Try new-to-me pattern companies! 6. Make a vintage pattern! I've got a dress pattern in mind, but haven't delved in yet. I imagine I may stumble upon more vintage patterns now that I'm back in the U.S. and have access to more thrift stores, yard sales and the like. So, there's my update, a mixed bag of meeting and not meeting goals, a bit of goal post moving and circumstantial changes! I'm unlikely to make substantial progress over the next few months, as my sewing equipment is on the slow boat from Asia until early September. I did borrow a machine from my mom, as well as some tools, and I brought a few things to work on, but I don't have a serger or anything, so I won't do too many complicated projects. 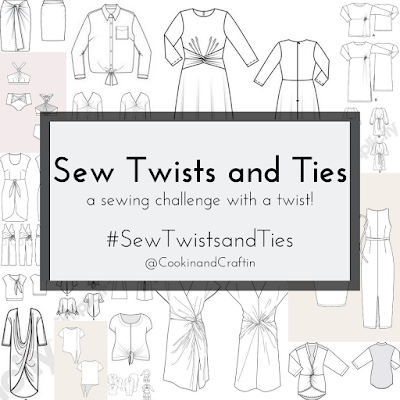 Did you make any sewing goals this year? How are you progressing on them?